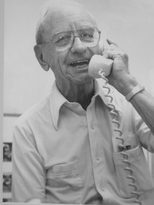 A group of citizens, organized by founder Edward Cruse (shown in the photo), started the meal delivery program in 1969. Meals were initially prepared at St. Martha's Church in Sarasota and distributed from the Venice-Nokomis United Methodist Church. 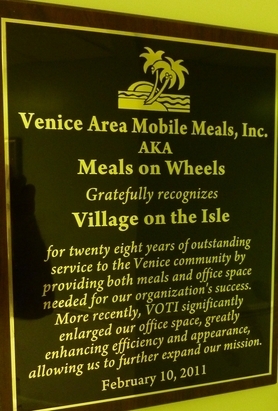 In 1978 the local service program became Venice Area Mobile Meals, Inc., a non-profit 501(c)(3) organization. Venice Area Mobile Meals, Inc. is a fiscally responsible, all volunteer organization that provides a "Mobile Meals" community service to the Greater Venice, FL area to anyone unable to prepare a meal due to mental or physical disability, 6 days a week, 52 weeks a year, holidays included. Overall direction and financial management is provided by a Board of Directors of 11. The office is staffed each morning with 2 managers, and other volunteers for data entry, invoicing and accounts receivable. Route Directors manage 16 routes and over 190 drivers, assistants and substitutes. Many volunteers, along with community supporters participate in fundraising events. Venice Area Mobile Meals, Inc. is not associated with Meals on Wheel Association of America, nor does the organization receive any financial funding or support from any government entity..
which prepares all meals for Venice Area Mobile Meals, Inc.
Venice Area Mobile Meals, Inc. is a non-profit corporation listed with the State of Florida, Department of State.